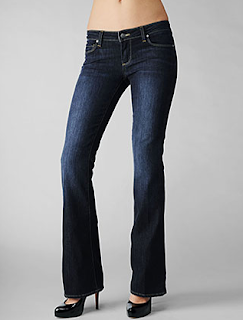 I've been a fan of Paige Denim jeans ever since I put my bootie in one of them back in 2005. Paige was one of the most requested fit model for denim designers- Designers used to use her bootie to create their line of jeans and it occurred to her that she should start creating her own line of denim. Paige Denim was launched in Feb 2005. She's a size 27 and I'm a size 27..it's a match made in bootie heaven! At the time, I knew of only two places in Montreal where I could find the brand..James (in Westmount) and Holt Renfrew. The variety was very very limited and the jeans were priced between $150-$200. I start buying the jeans off ebay or waited for major sales. The popularity of the jeans grew and the line grew as well. The first time I visited Century 21 (Fulton stop), I was pretty annoyed at the disorganization of the place. There's lot of great brands and variety but if you found something you liked..the sizes were limited, the item is either dirty or damaged and sometimes still too expensive. Manolos for $300 instead of $875. $1000 Prada dress down to $300 is still pricy. However, many visitors speak of Century 21 as the go-to place to shop when visiting NY. A friend of mine spent hours there once..I thought I'd give it another try. I can say though for my Canadian friends that Century 21 > Wieners... and I loved Wieners. Overturning my disappointment of the store was when I found an intact pair of Paige denim, Laurel Canyon, priced at $50 instead of $189. I tried it on. 27 didn't fit me quite as well as it once did (damn cupcakes) but 28 was too big. I'm sure it'll loosen up (I hope!). There were also J Brand and other "hot" brands there but the styles were not so hot. I never heard of been to Michael's..inform me! Totoro does exist in the wild..
Montreal weekend January 2011 : Friends and Food!